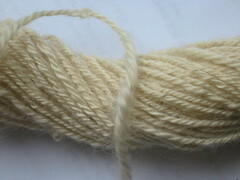 75 yds, 11 wpi, 3 1/2 oz, navajo plied. my first spinning fuckup. take 1 bag of wonderful slinky, sheeny wensleydale, overspin to buggery and tada! 75 yards of string :( lesson learned: listen to my instincts, i wasn’t happy with this early on in the spinning. should have run up a couple of short samples. every now and again the loveliness tries to break out in a looser area, should have been able to spot that before i spent hours spoiling it. 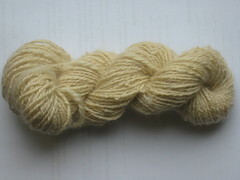 plus lesson: save the big one for plying, it only makes for achey wrists and grief piled up with 4oz of singles. in fact it might have been using the bigger spindle (greater momentum, more twist) that caused the problems, although i used it no worries for the shropshire and side by side they look like they have very similar amounts of twist, i guess it’s just the fibre just wants less twist (the shropshire was nothing special to look at so lost nothing by being so tightly spun, and is still bouncy compared to the limp wensleydale). but on the up side the wpi is close, so one mission accomplished at least.